Research into the gastrointestinal health of dogs has revealed their microbial populations are quite different from ours. However, being mammals, their microbial populations develop in the same way as us. This also means they can benefit from a selection of bacterial species known to convey a health benefit otherwise known as probiotics. 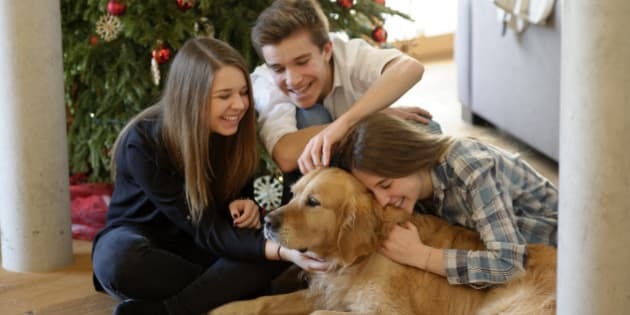 This Christmas, along with the usual array of inanimate gifts such as toys, clothes, and gadgets, some Canadian families will be welcoming a living addition to their homes in the form of a puppy. Without a doubt, the sight of a new pet will bring smiles and exclamations of joy from the young to the old. Best off, the delight will be sure to last for years to come. Of course, owning a dog is far more complex than a new gaming console or power drill. This companion animal requires a combination of love as well as care for the best health. Having a good veterinarian is recommended as well as a good diet plan to ensure they are kept in tip top shape throughout the year. Yet as any dog owner knows, the latter may be difficult to maintain especially for those animals with a penchant for tasting whatever might be within sniffing distance. This could lead to the introduction of pathogens into the intestinal tract. This is bad not only for the animal, but also for humans. Many infectious diseases can be transmitted from pets to humans leading to an unwanted outbreak in the home. Research into the gastrointestinal health of dogs -- and cats for that matter -- has revealed their microbial populations are quite different from ours. However, being mammals, their microbial populations develop in the same way as us. This also means they can benefit from a selection of bacterial species known to convey a health benefit otherwise known as probiotics. While this may sound like a reason to venture out in search of pet probiotics, there is a problem with finding beneficial options. In Canada, most probiotics are specifically approved for humans. Although there may be some similarity between a human and pet's gastrointestinal tract, the use of human species may not be all that helpful to a dog or cat. This means any product claiming to be probiotic may not be entirely effective. There may be, however, another way to ensure a pet's health using probiotics. Instead of giving live bacteria to the animal, we can provide the health-enhancing substances produced by these species. These substances, known as proteobiotics, can then serve their purpose in the gut and then simply leave the body through the usual route. More importantly, focusing on these individual molecules may allow for pet-specific regulation by Health Canada. To learn more about proteobiotics, I reached out to Hannah McIver, CEO of Microsintesis. Her company has been working with these molecules for the last five years and has been at the forefront of this area of research. From her perspective, this direction may revolutionize how we use bacteria for health in pets and maybe one day in ourselves. "We all know about probiotics but what most people don't realize is that the bacteria are not the main reason our health improves. It's the bio-active substances they make -- the proteobiotics -- that really serve us well. We've been working to identify these substances and then test them in the lab and in animals to find out which ones are the best." One of the most impressive examples of proteobiotics is a group of small proteins, known as peptides, made by probiotic bacteria. These peptides contain only a few amino acids but they can interfere with the communication pathways harmful bacteria use to cause infection, a measure of virulence. But as McIver points out, there's a catch. "The peptides are extremely effective when they are concentrated. You simply cannot get them by taking probiotics daily. We create the conditions in the fermentation process to stimulate the production of these molecules. They can be given to animals in the form of an edible liquid or dried powder. For instance, veterinarian can then offer them as a means to keep a puppy or that old dog safe from infection." As to which infections these peptides prevent, McIver points to the research. "Dr. Mansel Griffiths at the University of Guelph, a pioneer in this space and the founder of the technology, has shown these peptides can reduce the virulence of many food borne pathogens, including E. coli O157:H7, and Salmonella.. Both of these are highly troublesome in both dogs and of course, people and, more importantly, can be antibiotic resistance." Perhaps the most impressive aspect to proteobiotics is their place in the Health Canada regulatory environment. Because peptides are non-living, they are not subject to the classification of probiotics. Instead, they fit under an interesting category known as Low-Risk Veterinary Products meaning they can be quickly reviewed and approved for sale. "Over the two years, we've worked with Health Canada to gain approval for our first product, Ygia. It has taken a while but this pales in comparison to a drug, which may take decades. This new regulatory path means we conduct all the regular testing required, but can share the benefits of these natural proteins with the public in a shorter amount of time. That means veterinarians will be able to give these products next month without a prescription." McIver's experience not only may be able to help those new dog owners in the near future but also may change the scope of health and wellness options in the future. Products can highlight the bacterial molecules instead of the bacteria themselves. While McIver's version is specifically designed for dogs, she has set an example for human markets. This may one day allow companies to highlight the actual beneficial molecules contained in their offerings and leave out the unnecessary -- and usually inaccurate -- use of the word probiotics in marketing.